Description: Choughs have blue-black plumage with a green sheen on their wings and tails. Their wings are wide with long primaries. They have a slender red bill which curves downwards. Eyes are black and legs and feet are red. Both male and female choughs look similar. Juvenile choughs are duller than adults with an orange bill and pink legs and feet. Nesting: Both male and female choughs build the nest in crevices and cavities of abandoned buildings, cliff faces and ledges, caves and mine shafts. It is a loose structure made from twigs and roots lined with mud and lined with softer materials such as wool and hair. Choughs lay 3-5 pale cream or green eggs with brown and grey markings which are incubated by the female for 17 days who is fed by the male. Chicks have full plumage at about 40 days but remain near the nest and continue to be fed by both parents for another week. They become independent a month later but remain in the family group until the following breeding season. Feeding: Choughs eat insects and larvae including caterpillars, grasshoppers, spiders and worms. They will also eat berries in winter. 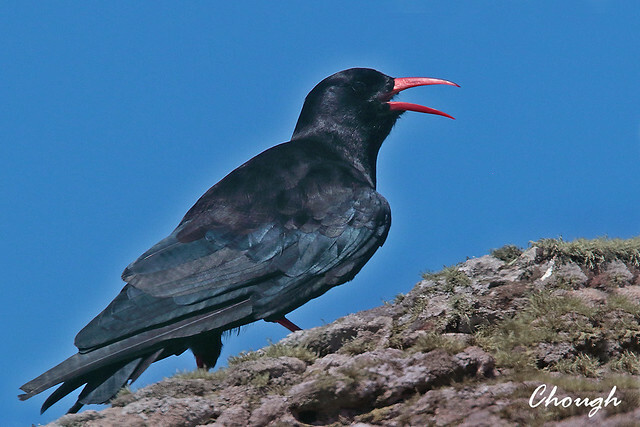 Where to see them: Choughs can be found near the west coasts of Wales, Cornwall, Ireland and the Isle of Man. Did you know? The chough is sometimes known as the ‘Cornish chough’ due to its close association with the county. It is found on the coat of arms and legend has it that the soul of King Arthur departed this world in the form of a chough.